Walker vs Curry. On TV. Best thing ever. So there’s this thing in Alabama called Thursday Night Lights. I never knew about it until last week. 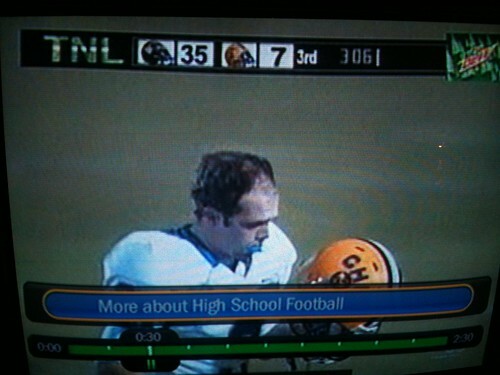 Each Thursday during high school football season, the local My-whatever channel broadcasts a game. The week I was home was Walker vs. Curry. Yes, the greatest rivalry in Walker County was broadcast through the majority of the greatest state in America on the only weekend I’ve been home this year. Walker won… very easily, mind you. If you don’t want to read the article, the image above and video below pretty much sum up the game. Winning a championship is fun. Watching your team win a championship in person is even better. Soccer doesn’t mean much to most of you. 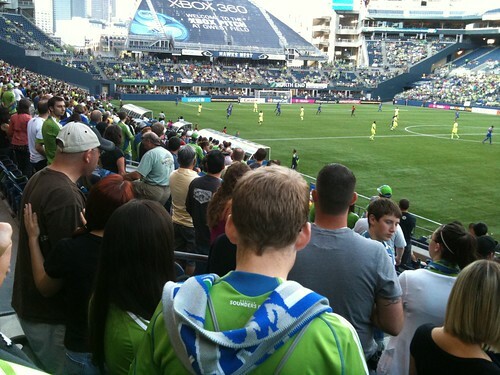 It didn’t mean anything until I moved to Seattle and experienced the first MLS Sounders match. It’s a huge deal in Seattle. So huge, it still freaks me out. 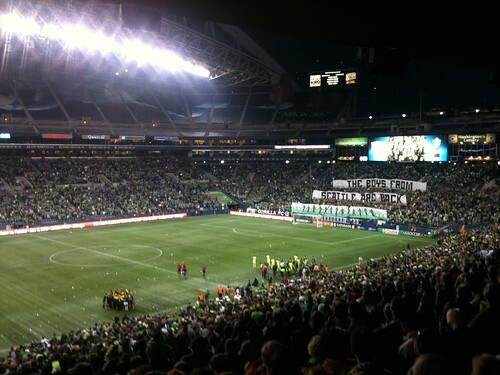 Seattle won its 2nd straight US Open Cup last night in front of a US Open Cup record crowd of 31,311. The record attendance smashed the old mark of 21,583 set in 1929. Dating back to 1914, the U.S. Open Cup is the oldest cup competition in United States soccer and is among the oldest in the world. For those of you getting in to soccer, the CONCACAF Champions League is soon to be in full effect. I know that you’re all devout (or becoming devout) Sounders fans. My goodness… look at these attendance stats. Oh, soccer. You are a welcome sight. Though less than 4 of you are excited about the English Premiere League beginning this weekend, most of you love our US Men’s National Team boys. And guess what? They’re back in action tomorrow night. If any of you NYC blog readers will be in attendance, do tell. We’re legitimately jealous. Howard gratefully claims it. Distribution, brilliant. Landon Donovan. Are things on here for the USA? Can they do it here? Cross! And Dempsey is denied again! AND DONOVAN HAS SCORED! OH, CAN YOU BELIEVE THIS?! We lost 13-3 in indoor soccer last night. 13-3. Seattle took on the World last night. We won. Alright… so maybe we won 1-0 over in the first of two preliminary games against a team that I could have beaten 10-0, playing with one leg tied behind my back. But it’s international soccer in Seattle, and the US team won. I love this. Really. If Jasper becomes the competitive disc golf center of the universe, nothing would make me happier. I’ve watched this clip 30 times, and I still get chills. Video from the Seattle Times of fans watching the game at the Atlantic Crossing Pub. July 13, 2010 is just around the corner. 72 days until football season. No, this is not the actual cover… just my dream. Just so you know, the rest of the world hates fakers as well. When I first started watching soccer the aspect that bothered me (still bothers me) is the fake or overly dramatic falls players love to take, only to bounce back up miraculously once the whistle blows. It’s especially hard for us American football lovers who are accustomed to watching wide receivers making shoestring grabs while two defenders drag him down by the facemask. Those of you who watched the Brazil-Ivory Coast match saw faking-the-injury on soccer’s biggest stage. If you missed it, catch the clip here. The soccer world – especially the American soccer crowd – hates crap like this, too. Seattle’s coach has gone so far to ask his players not to pull stunts, which quite frankly has made getting into soccer in Seattle all the easier. Interactive: Twitter trends during the World Cup matches. I’ve played an average of 2 indoor and/or outdoor soccer games per week over the last 12 months. I won a game last night for the first time in 9 months. After struggling to develop a viable electric light-bulb for months and months, Thomas Edison was interviewed by a young reporter who boldly asked Mr. Edison if he felt like a failure and if he thought he should just give up by now. Perplexed, Edison replied, “Young man, why would I feel like a failure? And why would I ever give up? I now know definitively over 9,000 ways that an electric light bulb will not work. Success is almost in my grasp.” And shortly after that, and over 10,000 attempts, Edison invented the light bulb. And we’re all the better for it, and thankful he persevered. In case you missed it, The New York Post wins the award for the best post-match headline from the England-USA World Cup match.